1. The MT series jumbo drilling rig is a hydraulic top hammer drilling rig designed for a 12-35m3 cross section for use in underground mining projects. 2. 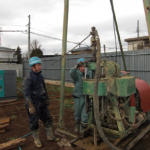 Robust universal drilling boom creates ideal face drilling coverage. Automatic parallelism and 360 degree roll over enable easy, fast and accurate positioning for face drilling, sideways drilling and bolt hole drilling. 3. The configuration of components allows for the operator to have a clear view when drilling and travelling. A powerful and well balanced 4-wheel drive chassis lets the tunnelling drilling rig move through limited space and tough terrain in the mines. A dual circuit service brake and enclosed multi-disc parking/emergency brake ensure safety in tramming and on sloped terrain. 4. Field proven high frequency hydraulic drifter delivers high performance. A trapezoidal percussion piston optimizes shock wave transfer efficiency, so the drill can penetrate deeper while decreasing cost of parts replacements. 5.The operator cab is safe and comfortable. Many automatic features simplify drilling control so miners can focus on fast and accurate drilling. 6. All service points of the hydraulic drifting jumbo are easily accessible, simplifying routine maintenance.